Yerbamate includes green and citrus notes, tea, aromatic herbs, mate, mint, estragon, rosewood, ylang ylang, new-mown hay, lavender, galbanum, labdanum, tree-moss, patchouli, vetiver, aromatic woods and powdery & spice notes. Yerbamate opens on citrus and fresh herbs, as advertised, and the first few minutes are sharp and bracing. As it calms, the grass and hay join in, along with bitter tomato leaf, and it begins to smell rather like a vegetable garden baking in the sun on a hot August day. Further on, it switches gears and leaves the fresh outdoors behind; in its place, we get sweet, resinous-ambery notes, along with hints of smoke and soap and a fair-to-middling dusting of powder. Yerbamate is a dense fragrance, very much in keeping with Lorenzo Villoresi's style — he has a few relatively light scents, but by and large, this is not a line you turn to for transparency. It is also a distinctive fragrance, and I have always admired it greatly without being able to decide if I actually like it. It strikes me as a fragrance that would take a certain kind of person to pull off, which is, I suppose, exactly the point of a niche scent, right? If you've tried Yerbamate, do comment. Yerbamate is a unisex Eau de Toilette, and the lasting power is excellent. 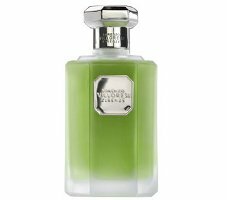 For buying information, see the listing for Lorenzo Villoresi under Perfume Houses. Yerbamate is a surprisingly fresh, complex juice that wafts out of the bottle bright, green and heady. Twenty minutes onto the skin it is dense, sweet, heavy, and agressive. The freshness is replaced by a sharp powderiness which clings and refuses to mellow into a bottom note. Villarosi is known for his dense perfumes, but I felt lost in a blizzard of suffocating powder at the drydown. I bought Yerbamate because I fell in love with its herbal complexity, and thought it would be perfect for summer. Summer came, and Yerbamate…wasn't quite perfect. As SniffQ says, it refused to mellow. It stayed aggressively herbal and, if anything, seemed to get stronger the more I wore it. So now I'm wondering if the coldest weather will suit it better…waiting for February…sigh. No, you're not, LOL…just saw that perfume bay is selling *samples* of Chaos for $10 or something. That is how I felt the first time I tried it, and am wondering now if it was hot at the time. Today, it didn't strike me as oppressive at all, in fact, it was enjoyable to wear even if still not quite “me”, and it wasn't nearly as powdery as I remembered. Ah, sorry then that you've already bought it. But as I said above, it didn't seem too heavy to me today. Dense, yes, but not really heavy, despite the fact that we are having fairly warm weather for November. Hope it will work better for you when it gets good & cold. It is indeed strongly herbal. All of a sudden the before so easy to separate herbs blend together and I'm left with something refreshingly soapy accord. It reminds me of something, and although I always feel I've missunderstood a fragrance when I make the floor cleaner parallel, I can't help but to do it here. It smells very much like something like that which I've encountered before. I know this scent has lots of fans because people used to post about it on MakeupAlley when I first came there…but apparently none of them are going to comment here today. Thanks for the review, R! I am glad you mentioned the soapy quality of Yerbamate because I found all of the Villoresi scents to have that soapiness to them. I love them, Donna was my favorite of all of them. The Guerlain is fresh & crisp, this one is not: it’s sweetish, and very dense. If you’re looking for crisp, fresh, green, you might also try the Miller et Bertaux Green, green, green. Ack, can’t you get a sample first? That’s a very risky unsniffed choice. I was too impatient (maybe partly because of your review :P), guess I’ll get some vial from theperfumedcourt first. Ah, Lorenzo Villoresi, such an exquisite line! And the prices are correct for such a high quality (real, not only advertised, like Bond no. 9 or MDCI) perfumery! My idole.